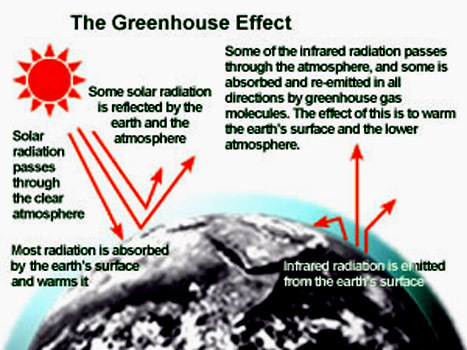 The greenhouse effect is a natural occurrence that maintains Earth's average temperature at approximately 60 degrees Fahrenheit. 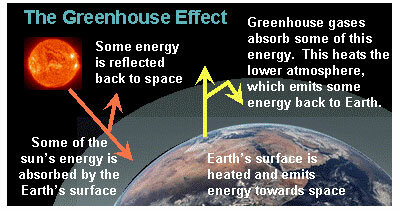 The greenhouse effect is a necessary phenomenon that keeps all Earth's heat from escaping to the outer atmosphere. Without the natural greenhouse effect it is certain that life on Earth would be difficult to sustain. Temperatures on Earth would be much lower than they are now, and the existence of life on this planet would not be possible. The global average temperature would drop precipitously 33 degrees from its current 15° to -18°C. The Earth would become an ice planet. 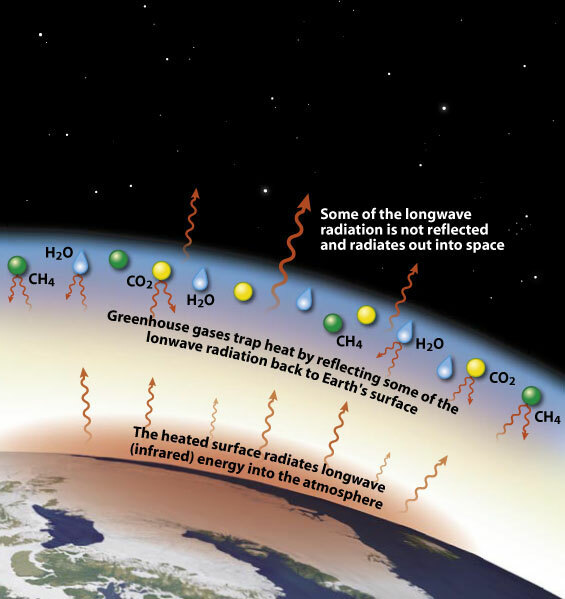 However, too many greenhouse gases in Earth's atmosphere could increase the greenhouse effect. This could result in an increase in mean global temperatures as well as changes in precipitation patterns. The Earth's atmosphere, a thin blanket of gases, protects the planet from the harshest of the sun's ultraviolet radiation. The atmosphere, by trapping the Earth's warmth, keeps rivers and oceans from freezing. Carbon dioxide and water vapor are the most important gases in creating the insulating or "greenhouse effect" of the atmosphere. 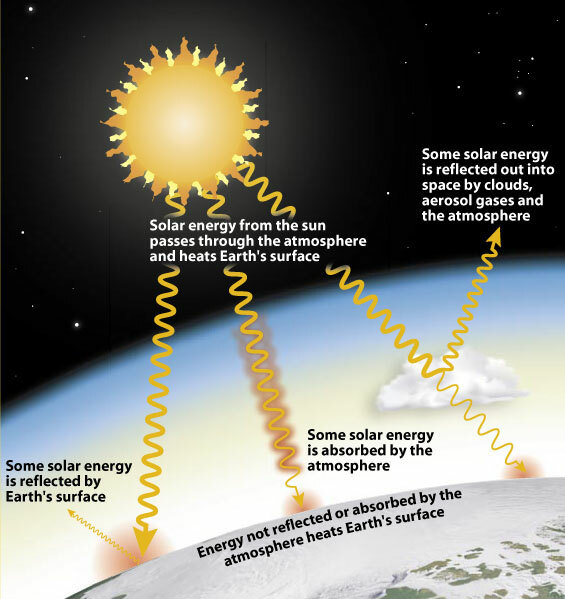 Some heating of the atmosphere occurs when molecules, aerosols, and particles in the air absorb radiation from the sun. Some heating occurs from contact with Earth’s surface, which absorbs most of the sun’s energy and emits long-wave radiation back into the atmosphere. The Sun powers Earth’s climate, radiating energy at very short wavelengths, predominately in the visible or near-visible (e.g., ultraviolet) part of the spectrum. Radio: Yes, this is the same kind of energy that radio stations emit into the air for your boom box to capture and turn into your favorite Mozart, Madonna, or Justin Timberlake tunes. But radio waves are also emitted by other things ... such as stars and gases in space. You may not be able to dance to what these objects emit, but you can use it to learn what they are made of. Microwaves: They will cook your popcorn in just a few minutes! Microwaves in space are used by astronomers to learn about the structure of nearby galaxies, and our own Milky Way! Infrared: Our skin emits infrared light, which is why we can be seen in the dark by someone using night vision goggles. In space, IR light maps the dust between stars. Visible: Yes, this is the part that our eyes see. Visible radiation is emitted by everything from fireflies to light bulbs to stars ... also by fast-moving particles hitting other particles. Ultraviolet: We know that the Sun is a source of ultraviolet (or UV) radiation, because it is the UV rays that cause our skin to burn! Stars and other "hot" objects in space emit UV radiation. Roughly one-third of the solar energy that reaches the top of Earth’s atmosphere is reflected directly back to space. The remaining two-thirds is absorbed by the surface and, to a lesser extent, by the atmosphere. To balance the absorbed incoming energy, the Earth must, on average, radiate the same amount of energy back to space. Because the Earth is much colder than the Sun, it radiates at much longer wavelengths, primarily in the infrared part of the spectrum . Much of this thermal radiation emitted by the land and ocean is absorbed by the atmosphere, including clouds, and reradiated back to Earth. This is called the greenhouse effect. 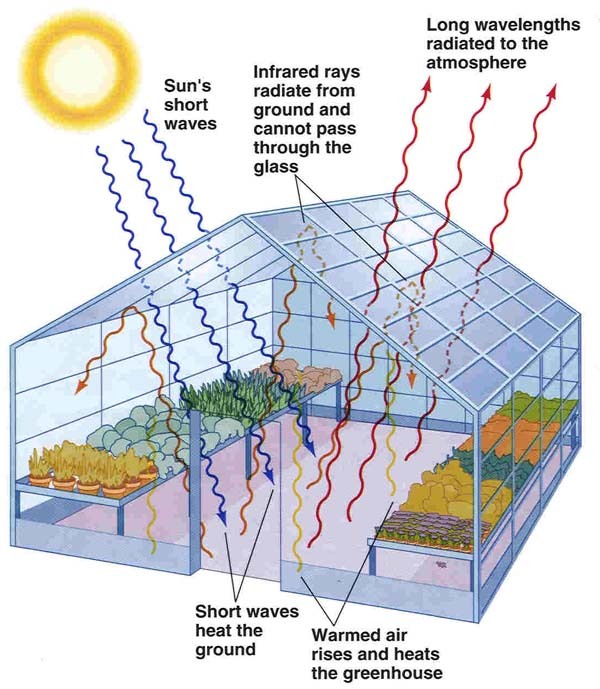 The glass walls in a greenhouse reduce airflow and increase the temperature of the air inside. Analogously, but through a different physical process, the Earth’s greenhouse effect warms the surface of the planet. Without the natural greenhouse effect, the average temperature at Earth’s surface would be below the freezing point of water. Thus, Earth’s natural greenhouse effect makes life as we know it possible. However, human activities, primarily the burning of fossil fuels and clearing of forests, have greatly intensified the natural greenhouse effect, causing global warming. The two most abundant gases in the atmosphere, nitrogen (comprising 78% of the dry atmosphere) and oxygen (comprising 21%), exert almost no greenhouse effect. 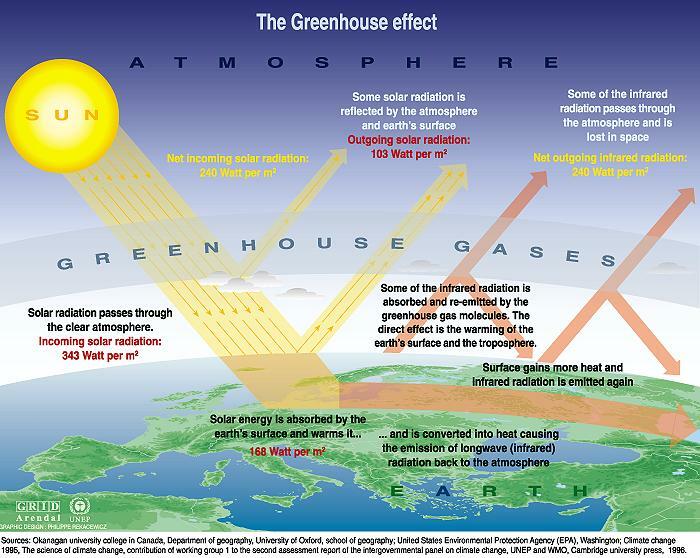 Instead, the greenhouse effect comes from molecules that are more complex and much less common. Water vapor is the most important greenhouse gas, and carbon dioxide (CO2) is the second-most important one. Methane, nitrous oxide, ozone and several other gases present in the atmosphere in small amounts also contribute to the greenhouse effect. In the humid equatorial regions, where there is so much water vapor in the air that the greenhouse effect is very large, adding a small additional amount of CO2 or water vapor has only a small direct impact on downward infrared radiation. However, in the cold, dry polar regions, the effect of a small increase in CO2 or water vapor is much greater. The same is true for the cold, dry upper atmosphere where a small increase in water vapor has a greater influence on the greenhouse effect than the same change in water vapor would have near the surface. Adding more of a greenhouse gas, such as CO2, to the atmosphere intensifies the greenhouse effect, thus warming Earth’s climate. The amount of warming depends on various feedback mechanisms. For example, as the atmosphere warms due to rising levels of greenhouse gases, its concentration of water vapor increases, further intensifying the greenhouse effect. This in turn causes more warming, which causes an additional increase in water vapor, in a self-reinforcing cycle. This water vapor feedback may be strong enough to approximately double the increase in the greenhouse effect due to the added CO2 alone.